When choosing your career, it’s important to seek out jobs that are secure, allow a good work-life balance, and not to mention a decent salary. You might think that a high-paying job is out of your reach, but Australia’s highest-paying industries might surprise you. 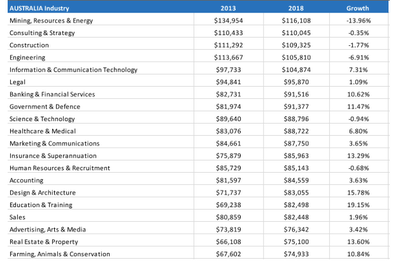 Mining, Resources & Energy has won the title as the most lucrative industry for Australian workers and has consistently been a top performer in the salary stakes, according to Seek. The data shows workers in this industry enjoy and highest average advertised salary of $116,108. Consulting & Strategy and Construction are the next two richest industries, with average salaries of $110,045 and $109,325 respectively. Engineering ($105,810) and Information & Communication Technology ($104,874) came in a close fourth and fifth positions. Salary moments across 5 years is as below. It’s all very well knowing where to look to boost your paypacket, but do you know which industries you could actually avoid if you want to steer away from some of Australia’s lowest-paid jobs? According to Seek, Administration & Office Support has the lowest average wage at just $58,671, however the Call Centre & Customer Service industry came a very close second with $58,671. Retail & Consumer Products ($60,704), Hospitality & Tourism ($61,944) and Sport & Recreation ($65,900) make up the remainder of the five lowest paying industries. Till today, there have been 14891 visitors (25021 hits) on this page!